Love Shack Shake Pup Meet Ups are a great time to meet Canine Companions puppies and assistance dogs! If you have a Canine Companions assistance dog or puppy, we’d love to see you there to spread the word about the great work of Canine Companions. Meet ups will occur February 12 from 11:00 a.m.-12:30 p.m. at the Upper West Side, West Hollywood and Buckhead locations. All humans are welcome; however, only assistance dogs and Canine Companions puppies are allowed in the restaurant. Can’t make the Meet Up? Grab a shake at one of these Shake Shack locations from Friday, February 9 — Sunday, February 18. In NYC, the shakes will be at the Upper East Side (154 East 86th St) and Upper West Side (366 Columbus Avenue) Shacks. In LA, at the Hollywood (6201 Hollywood Blvd) and West Hollywood (8520 Santa Monica Blvd) Shacks. In Atlanta, at the Buckhead (3035 Peachtree Road NE, Suite A146) and Perimeter Mall (4400 Ashford Dunwoody Road, Suite 3025) Shacks. Love Shack, Baby! Shake Shack partners with the B-52s to create the Love Shack Shake for Valentine’s Day. NEW YORK, NY – This Valentine’s Day, head on down to the Love Shack! In a pairing for the ages, Shake Shack and famed music group The B-52s have teamed up to create the Love Shack Shake ($5.99): a strawberry blonde milkshake topped with whipped cream and glitter sprinkles. Inspired by The B-52s’ cult classic “Love Shack,” the Love Shack Shake will be available in select NYC, LA and Atlanta Shacks from Friday, February 9th—Sunday, February 18th. The sweetest part? The Love Shack Shake will help make a loving and life-changing match. 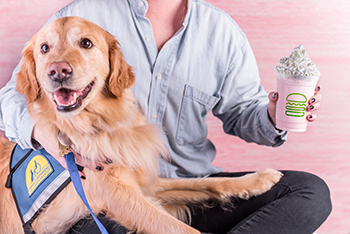 For every Love Shack Shake sold, Shake Shack will Give a Dog a Job® by donating $2 to Canine Companions for Independence, a non-profit that enhances the lives of people with disabilities by providing highly trained assistance dogs and a lifetime of support entirely free of charge. In NYC, the shakes will be available at the Upper East Side (154 East 86th St) and Upper West Side (366 Columbus Avenue) Shacks. In LA, the shakes will be available at the Hollywood (6201 Hollywood Blvd) and West Hollywood (8520 Santa Monica Blvd) Shacks. In Atlanta, the shakes will be available at the Buckhead (3035 Peachtree Road NE, Suite A146) and Perimeter Mall (4400 Ashford Dunwoody Road, Suite 3025) Shacks. Fun fact: the B-52s formed in Georgia in 1976 and performed their first concert on Valentine’s Day! “We’re shakin’ with excitement to celebrate Valentine’s Day with the Love Shack Shake and even more excited to support the great work of Canine Companions for Independence,” said Kate Pierson of the B-52s. Shake Shack is a modern day “roadside” burger stand known for its 100% all-natural Angus beef burgers and cage-free chicken sandwiches (no added hormones or antibiotics – ever), flat-top Vienna beef dogs, spun-fresh frozen custard, crinkle cut fries, craft beer and wine (available at select locations) and more. With its fresh, simple, high-quality food at a great value, Shake Shack is a fun and lively community gathering place with widespread appeal. Shake Shack’s mission is to Stand For Something Good®, from its premium ingredients and caring hiring practices to its inspiring designs and deep community investment. Since the original Shack opened in 2004 in NYC’s Madison Square Park, the company has expanded to more than 90 locations in 19 U.S. States and the District of Columbia, and more than 50 international locations including London, Istanbul, Dubai, Tokyo, Moscow, Seoul and more. It is well known that the B-52s are The World’s Greatest Party Band. And nearly forty years and over twenty million albums into their career, there can be no doubt as to why they remain one of rock music’s most beloved and enduring bands. Any mystery concerning the band’s longevity and ongoing appeal is immediately solved when exposed to a B-52s concert experience. From groundbreaking songs like “Rock Lobster,” “Dance This Mess Around” and “Private Idaho“ to chart-topping hits like “Love Shack” and “Roam” and “Deadbeat Club” to their thrilling reemergence on the pop scene with their 2008 CD Funplex, the B-52s’ unforgettable dance-rock tunes start a party every time their music begins. Canine Companions for Independence provides highly-trained assistance dogs to children, veterans and adults with disabilities. Established in 1975, Canine Companions has six regional training centers across the country in Northern CA, Southern CA, NY, OH, FL and TX. Canine Companions is recognized worldwide for the excellence of its dogs, and the quality and longevity of the matches it makes between dogs and people. Since its inception, Canine Companions has placed more than 5,600 assistance dogs with people with disabilities. Help make a match. Give the Gift of Independence—and Give a Dog a Job®. Visit cci.org.